The Hemingways - Never Alone - Alternative Tracks "In a music world of ‘junk food’ pop (quickly produced, poor quality and easily forgotten) I want to support alternative tracks I believe do deserve to be listened to"
Blending rock with touches of youthful indie earnestness, The Hemingways have just released their debut single ‘Never Alone‘. 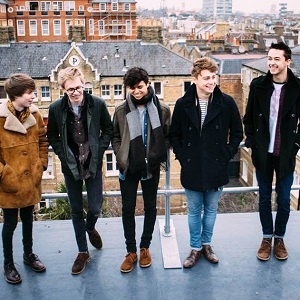 The five piece, from Essex, is made up of James Burrage on lead vocals, Louis Takooree on guitar, Ben Butler on keys, Noah Henry on Bass, and Jack Ames on drums. Although most of the band are still in their teens, some members have been playing together for nearly ten years. A five piece is quite big, but because of the tightness of the band, all the individual elements in the band work really well together to create their exciting sound. Propelled by the powerful lead vocals of Burrage with his slightly raspy vocal delivery ‘Never Alone‘ is raw and honest. It’s a song full of aggression, passion and emotion, incorporating pounding rhythms, driving guitar parts and a mighty chorus. Having already received airplay on BBC Essex Introducing, the band are now exploding on the live scene, with a gig at the Cambridge Junction last month and an upcoming date on 26th May at Colchester’s V-Bar. The Hemingways is a young band with plenty of ambition, check them out live and give this debut track a listen.